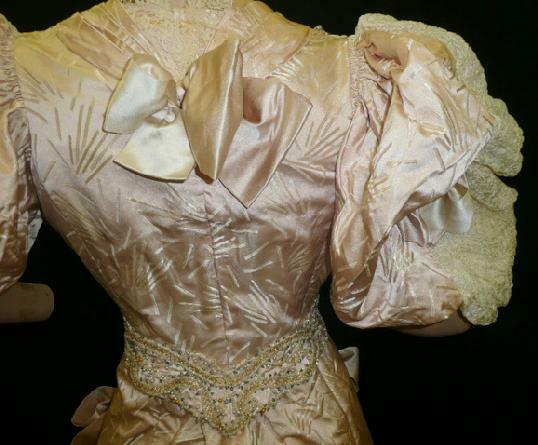 This auction is for a Stunning original 1890 to early 20th century Lady's Pink Beaded Brocade 2 piece Gown. 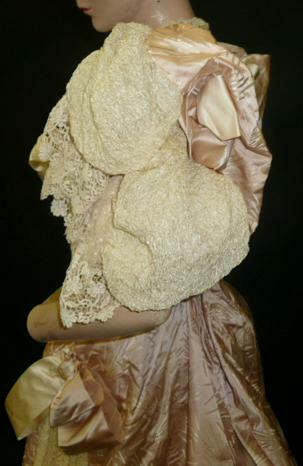 Fashioned with the most luxurious silk satin brocade in a lovely shade of pale pink and ivory along with ivory rippled crepe fabric and very wide silk satin ribbon. A 11 metal stayed polish cotton lined bodice has a cinched waistband with "Tansle Springfield Mass". 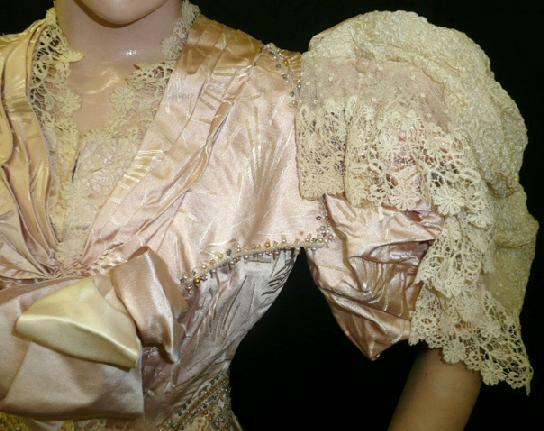 Extravagant leg of mutton sleeves that are created with gorgeous wide lace, matching brocade, the ivory rippled crepe fabric and matching to the skirt large two toned bows slightly hidden in between the crepe and brocade. 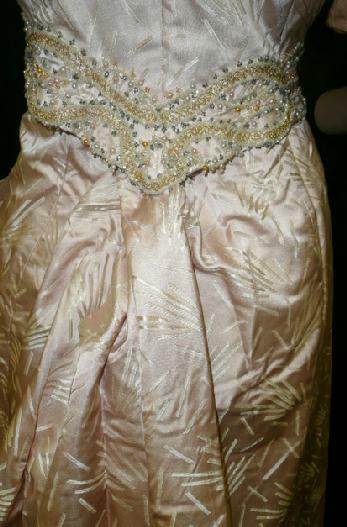 The V neckline has matching lace, a wide overlaying collar that is decorated with gold glass beads, pink and white pearls and silver rhinestones all that coordinates with the superb wide V opulently decorated waistline. 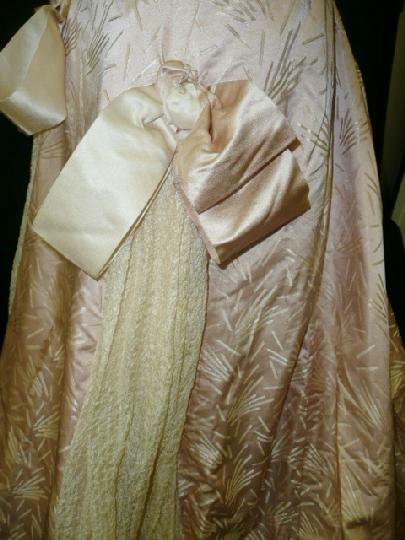 All this with a very large two toned (pink and ivory) satin bow and a smaller fabric rosette on the right side of the tucked neckline and shoulders. 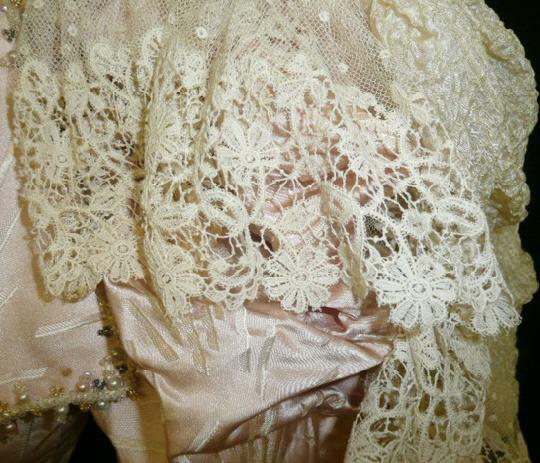 A blind front alternating hook and eye closure that is covered with more of the superb lace; along with underarm shields there is a large padding attached to the underarms which I believe is to accent and create a larger bust. The highly deocrated 9 gored skirt is just as lovely as the bodice; the lovely and quite interesting ivory crimped / rippled crepe fabric creates the inserted panels that are topped with huge matching to the bodice bows. 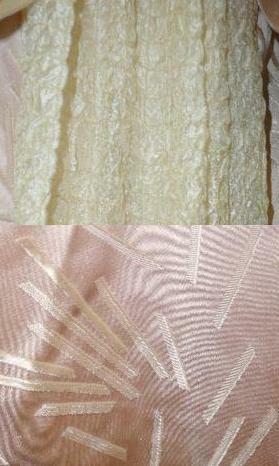 It is a silk and chintz lined full skirt with a slightly pleated waistband and a lovely ivory crimping sheared underskirt. 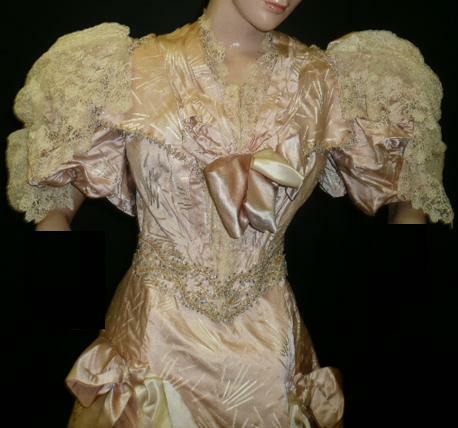 A very wearable size, the mannequin is a size 2/4 and the gown is just slightly too large. 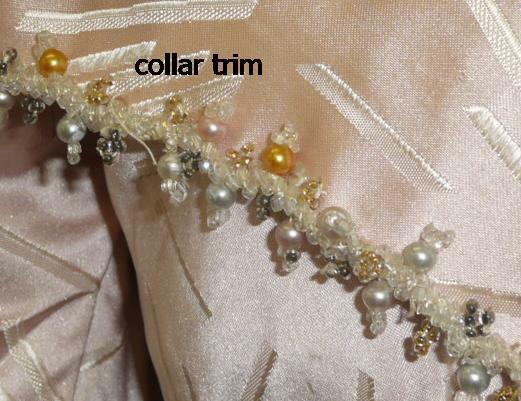 Measurements are taken laying flat, closed and across; 35" underarm to undearm, 26" waist and 53" from shoulder to front hem. 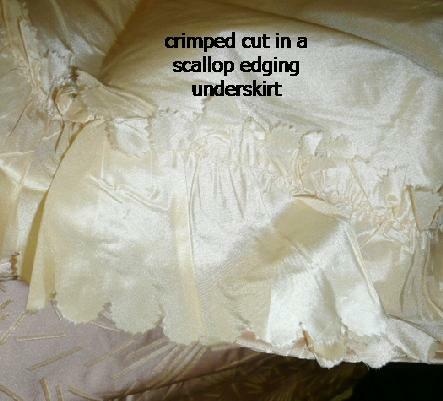 In very good very clean sound condition including the silk inside the skirt, 2 narrow spots on the front skirt and some very faint overall yellowing that can only be noticed with certain light, it seems in the actual daylight it is extremely hard to detect. 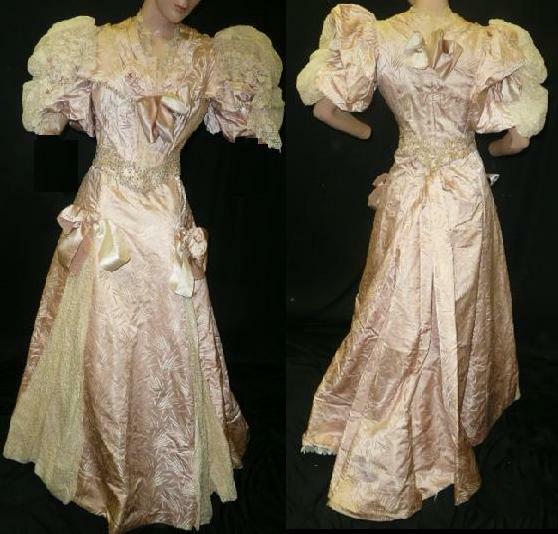 Overall I feel this stunning gown is in extremely good very sound condition and could easily be worn and certainly would be a magnificent addition to any any serious collection. 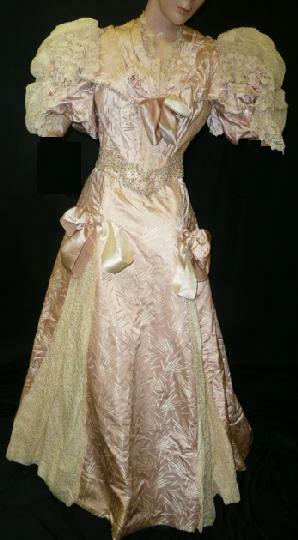 A lavish gown that exemplifies the Gay 90's to early 20th Century era.